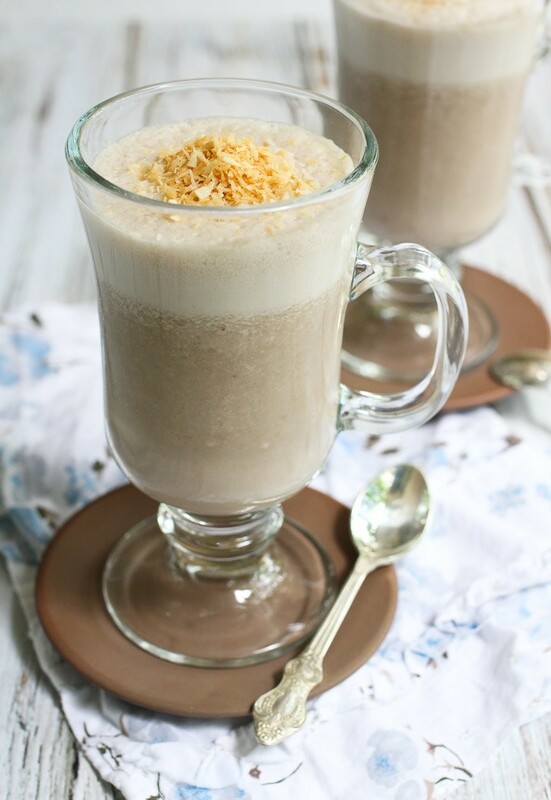 This healthy coffee smoothie is made with banana, toasted coconut, your favorite nondairy or cow’s milk, and a touch of vanilla. 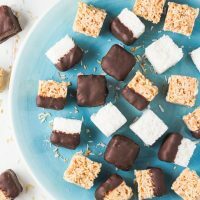 It’s refind sugar free, delicious, and very easy to make. Ahhhh, coffee… Some love it, some hate it and some are addicted to it. Some say it’s good for you and others have all the evidence lined up to prove that it’s bad for you. OMG, who is right and who is wrong? Who do you trust? The answer is very simple: you can only trust yourself and your body. How does your body react to coffee? I used to drink coffee every day. I enjoyed it a lot but then I noticed that coffee made me hungry. At that time, I had no idea about glycemic index, blood sugar, insulin response and all other things I write about on this blog. However, I didn’t like how coffee made me feel. So, I decided to stop drinking coffee and see what happens. I found that I could live just fine without drinking coffee every day. I felt much better and didn’t experience those sudden hunger pangs. Since then, I only drink coffee occasionally. 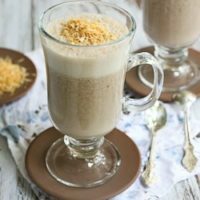 I also really like coffee based desserts and healthy coffee smoothies. 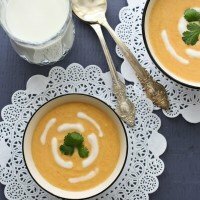 And paired with some toasted coconut, it’s just yum!!! 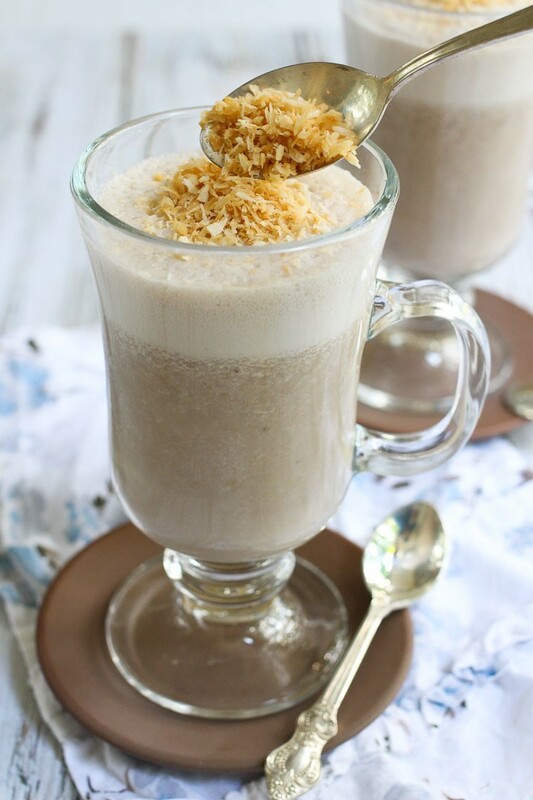 You only need about 1/4 cup of shredded coconut for this Healthy Coffee Smoothie with Toasted Coconut. But I love it so much, I always toast some more. This healthy coffee smoothie is made with banana, your favorite nondairy or cow’s milk, toasted shredded coconut, and a touch of vanilla. Refind-sugar free. To toast the coconut, preheat a frying pan over medium heat. Place the shredded coconut on the pan and toast it constantly stirring. The coconut will start turning golden brown and crispy. Once all the coconut is nice and golden, take the pan off the heat and transfer the coconut to a plate otherwise it will keep toasting because the pan is still hot. Place the cold coffee, bananas, milk and vanilla extract into a blender and blend until smooth. 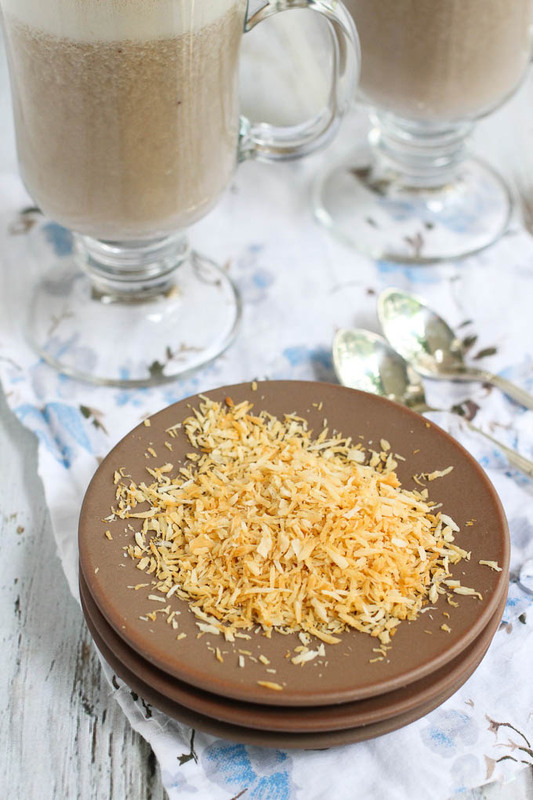 Pour into glasses and top up with the toasted coconut. Nutrition information is a rough estimate for 1 of 2 servings calculated for the smoothie made with almond milk. I am so glad you liked it 🙂 ! Mmmm coconut is good. I def will be using a lot of it haha!